GARRY Bunker drives a Kenworth 904 for Ringer Transport, of Townsville, and was carrying Variety Bash cars when Big Rigs saw him on August 24. The 60-year-old was parked beside the bypass road in Charters Towers and was happy to have a yarn. "I have brought the cars down from Darwin to Townsville and they are then heading to Kuranda for another Variety Bash event from Kuranda on the Atherton Tablelands to Katherine in the Northern Territory," he said. This much-travelled truckie likes stopping at the BP Hughenden. "It has pleasant people and the food is good and reasonably priced," he said. Away from work Garry's hobbies are bush walking and boating. 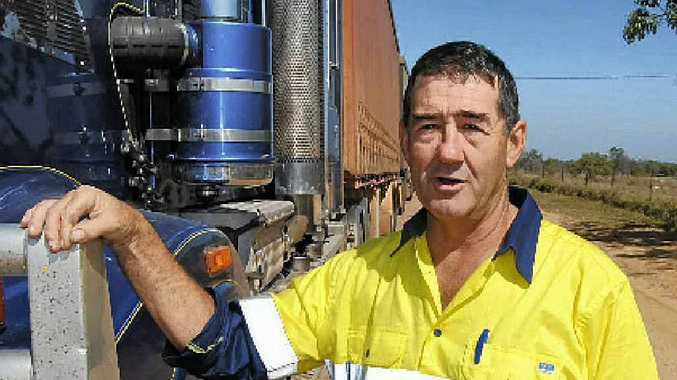 A truckie for 14 years, Garry reckons the Flinders Hwy between Richmond and Hughenden is the worse he travels on.